Homerton College is unique amongst the Cambridge colleges as a result of its parkland character. 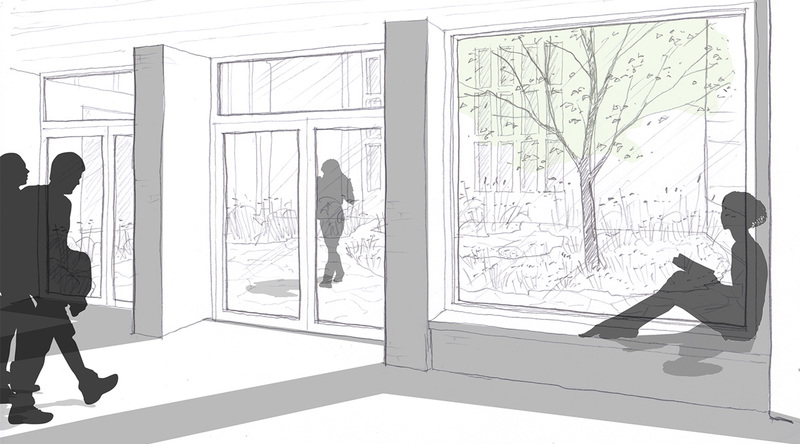 Our strategy is to integrate the new dining hall into this parkland context, whilst reinforcing the sense of enclosure to the central lawn and adding to the intimate courtyards nestled within the buildings. The existing strip of mature woodland and diverse meadow to the west will be added to and extended. This woodland character will flow right up to the new dining hall and around the western side to form an ornamental woodland courtyard helping anchor the building in the landscape. 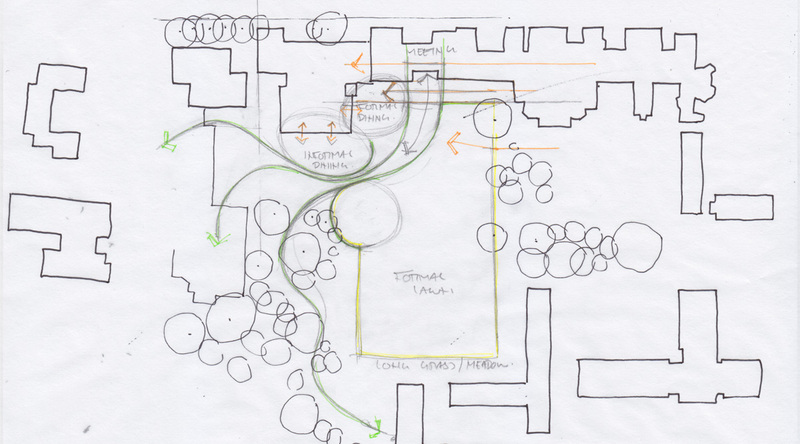 The sense of enclosure to the existing formal central lawn is key landscape element and will be reinforced to the west by the extended woodland, and to the north by a formal paved path. A new dining terrace will be created adjacent to the dining hall providing an informal outdoor dining space in the summer. When not used for informal dining, it will become a gathering space with undercover alcove benches and informal seating on the steps. This space has been designed to become the focal point of the central lawn and a place to catch the morning sun. 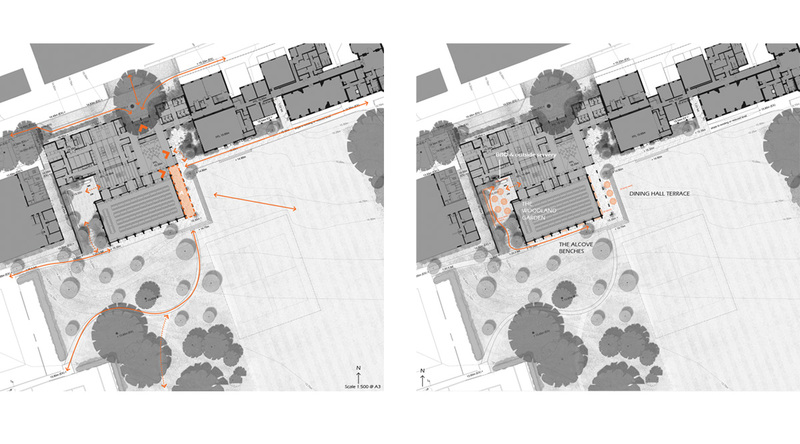 Adjacent to the dining terrace is the smaller of the two courtyards, the Ibberson Courtyard, which we have designed to be an intimate and reflective courtyard space. The hard landscaping takes its cues from the adjacent Arts and Crafts Ibberson Building and will be softened by planting which will fray hard edges and be encouraged to colonise the stone and brick paving. 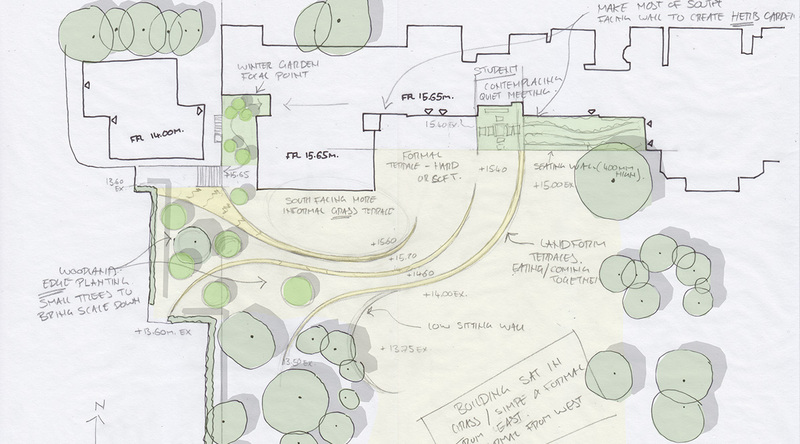 Shade-loving plants will dominate and a small feature tree will create an informal gateway into the space whilst also providing a key view from the new dining hall. 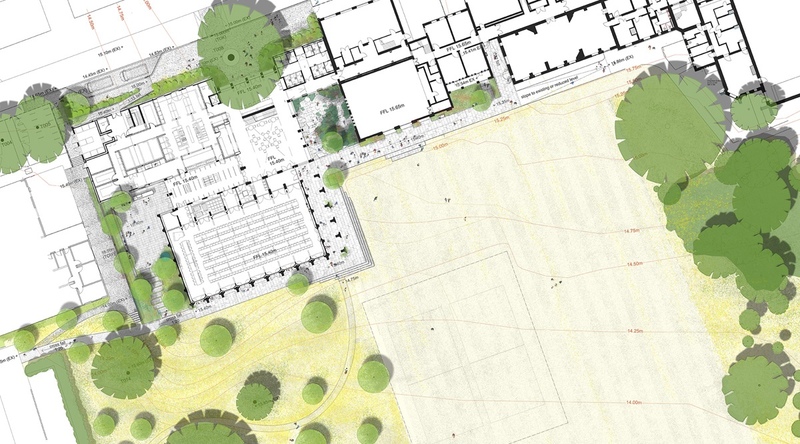 The Woodland Courtyard to the west of the dining hall will be a naturalistic woodland garden with a simple picnic bench defining a large, brick paved area. We have also designed the area surrounding the Harrison Drive entrance at the front of the college, taking the opportunity to address and improve the streetscape whilst ensuring easy access for deliveries. The plane tree becomes the central focal point, with the building entrance behind it, the existing railings are removed and informal, structural planting introduced to create a sense of arrival. 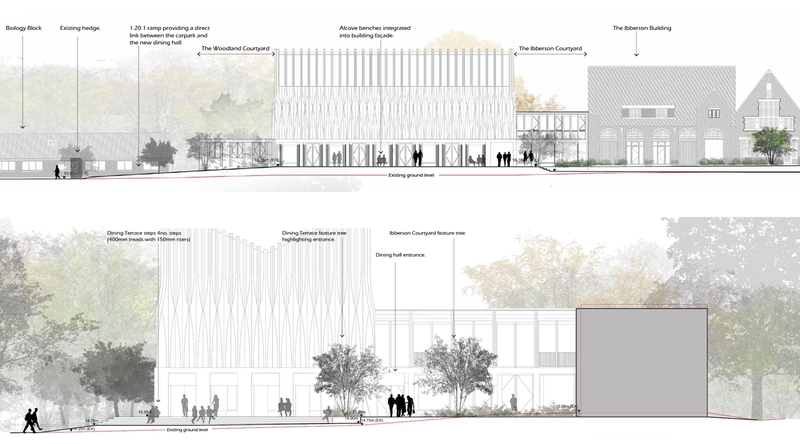 The campus is a sloping site and a number of mature trees are to be retained around the building, so detailed level design is key. The woodland landform helps to integrate the building into its surroundings, while the formal lawns to the east are reinforced and celebrated. The Woodland Courtyard and the Dining Terrace. The landscape has been designed so that outside dining can be incorporated without dominating.